Agriculture is one of the largest and most important industries in South Dakota, contributing $25.6 billion toward the economy and employing 115,000 people, according to Ag Week. Recognizing the importance of agriculture in South Dakota, Governor Daugaard has held an annual agriculture summit each year of his administration. During the 2017 Governor’s Agricultural Summit, a variety of topics were discussed including animal health, innovation, and the agricultural economy. South Dakota State Veterinarian Dustin Oedekoven discussed the importance of reducing dependence on antibiotics in livestock while Jim Roth from Iowa State University discussed the potential $200 billion negative impact foot and mouth disease could have on agriculture in the United States, if the disease were to become widespread. Economist Matt Roberts provided summit attendees with an overview of the agricultural economy, noting that while the price of grain has fallen recently, the market may be leveling out. Additionally, predicaments with crops in the past year have allowed some farmers to price their corn at $4 per bushel and soybeans at over $10 per bushel. For more agricultural data resources, visit the South Dakota Dashboard’s Further Data Resources. Real gross domestic product (GDP) in South Dakota declined by 3.8 percent in the first quarter of 2017, according to recently released data by the Bureau of Economic Analysis. With this drop, the Rushmore State finished 49th in the nation for GDP growth, lagging all other states except Nebraska. Texas landed in the No. 1 spot with 3.9 percent GDP growth. The table below shows that many states in the Great Plains region experienced similar, if less severe, economic contractions during the first quarter of 2017. The primary driver of widespread decline in output was a crunch in the agricultural sector. National output in the Agriculture, Forestry, Fishing, and Hunting sector declined by 39.8 during the first quarter. South Dakota experienced the largest decline in this sector in the nation—a drop of 6.0 percent. Setbacks in Retail Trade and Finance also contributed to South Dakota’s lagging GDP in the first quarter, with each sector falling by -0.4 and -0.1 percent, respectively. Areas of growth in the state included Construction at 0.6 percent, Government at 0.5 percent, Real Estate at 0.4 percent, and Durable Goods at 0.5 percent. Individuals earning a minimum wage in South Dakota must work 51 hours per week in order to afford a one-bedroom apartment in South Dakota, according to a recent report by the National Low Income Housing Coalition. 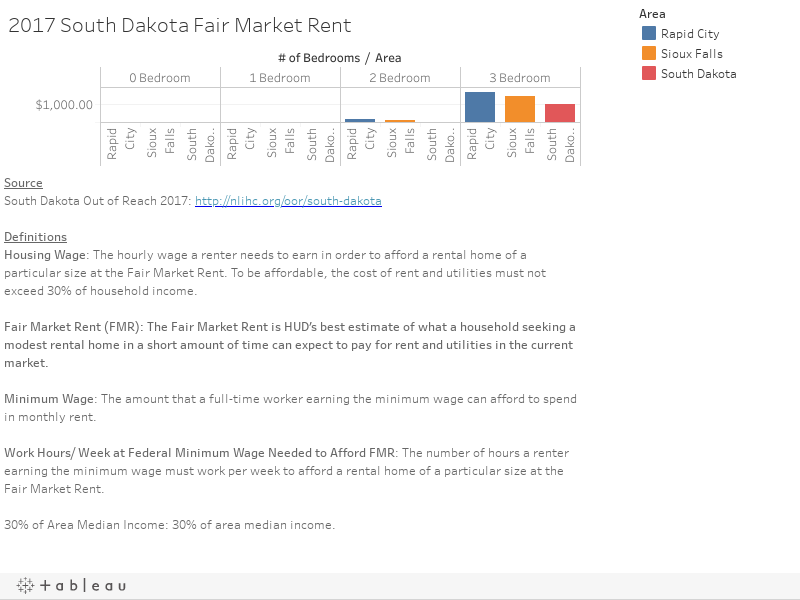 In order to afford a two-bedroom rental home, South Dakotans would need to make $14.12 per hour, or work 65 hours per week at the minimum wage. Douglas County is the most expensive county to live in, with an hourly wage of $16.58 per hour required to afford two-bedroom rental housing as defined by 2017 Fiscal Year Fair Market Rent. Pennington, Custer, Lincoln, Turner, Minnehaha and McCook Counties all required earners to make over $15 per hour to afford a two-bedroom apartment. To learn more about housing affordability in South Dakota and across the nation, view the full Out of Reach 2017 report by the National Low Income Housing Coalition. Real personal income in Sioux Falls grew faster than in all but three other metropolitan areas in the country in 2015, according to data released this week by the US Bureau of Economic Analysis (BEA). Adjusted for inflation, income received from all sources—including wages, rents and property incomes, and personal transfer receipts like Social Security or Veterans’ payments—rose by 6.9 percent in Sioux Falls, compared to 4.1 percent for the state as a whole. South Dakota’s growth in real personal income matched the nation as a whole and exceeded all neighboring states. With a 2.3 percent drop, North Dakota was the only state in the union to experience a decline in real personal income. Growth in real per capita personal income in Sioux City was 5.4 percent, compared to 3.3 percent in the Rapid City metropolitan region. On a non-adjusted or nominal basis, per capita income in the Sioux Falls metropolitan area in 2015 was $53,769, compared to $50,221 in 2014. It rose from $44,134 to $46,514 in the Sioux City metropolitan region and from $43,481 to $44,775 in the Rapid City metropolitan area. According to BEA data on the South Dakota Dashboard, economic growth (GDP) in each of the state’s three metropolitan area in 2015 lagged these increases in real personal income. In 2015, GDP increased 2.8 percent in Sioux City, 2.2 percent in Sioux Falls, and 1.0 percent in Rapid City. The South Dakota economy grew by 1.1 percent ranking the state 38th in the nation for real gross domestic product (GDP) growth, according to a recent release by the Bureau of Economic Analysis. Current dollar GDP was nearly $48.9 billion, accounting for 0.3 percent of total U.S. GDP. The finance and insurance industry grew by 6.3 percent nationally in the fourth quarter of 2016. South Dakota contributed the second largest percentage growth to the industry at 0.9 percent in the final quarter of 2016. However, agriculture continued to struggle in the Rushmore State, declining by 1.4 percent. Production of non-durable and durable goods also declined in the final quarter of 2016 at -0.2 and -0.1 percent, respectively. Regionally, South Dakota outperformed Wyoming and Iowa, which each experienced little economic growth at just 0.2 percent and 0.4 percent, respectively. The Minnesota economy grew by 1.7 percent—the highest in the region. The North Dakota economy grew slightly faster than South Dakota at 1.4 percent. South Dakota had the fastest growing economy in the nation during the third quarter of 2016, according to the U.S. Bureau of Economic Analysis. The Rushmore State’s gross domestic product (GDP) increased by growth 7.1 percent during the third quarter, while New Mexico ranked last in the nation with a 0.1 percent decline. The third quarter is typically South Dakota’s strongest as agricultural producers make their biggest sales. In 2016, the agricultural sector grew by 2.01 percent in the third quarter and accounted for the largest share of the state’s robust economic growth. The finance and insurance sector grew 1.69 percent in South Dakota in the third quarter, compared to 9.0 percent nationally. In this sector, the Rushmore State trailed No. 1 Delaware, with 2.50 percent growth, but outpaced No. 3 Iowa, which had 1.38 percent growth. The wholesale trade and government sectors grew 0.75 and 0.39 percent, respectively. Real estate, education, and non-durable goods posted negative growth. Significant growth in GDP was seen regionally, with North Dakota, Minnesota and Iowa reporting over four percent increases. Nebraska’s economy expanded by 3.9 percent, while Wyoming posted the lowest increase regionally, at 0.3 percent. Wyoming’s small increase may be attributed to declines in the mining, construction and government sectors. People were far more likely to move to South Dakota than move away, according to a new report from United Van Lines. This report is good news for the Rushmore State, but not for the reasons currently reported. South Dakota is not the most popular destination for people to move to—in actuality, California had the most number of inbound moves at 12,259 compared to South Dakota’s 341 total inbound moves. However, California had 12,488 outbound moves, resulting in California’s balanced migration. Conversely, South Dakota reported only 163 outbound moves. A couple of factors likely play into South Dakota’s top ranking, including retirees who want to live in the inter-mountain west. The United Van Lines report notes that one in four inbound moves nationally was for retirement reasons. With no income tax and a high quality of life, especially in the Black Hills, this may be a key factor. Second, people across the nation are less likely to move based on economic opportunity and more based on personal reasons, such as a desire to be closer to family or for retirement purposes. Additionally, the age of the internet has made working remotely a possibility—a substantial aid to those wishing to relocate to South Dakota. Within the Great Plains region, South Dakota had more inbound moves than North Dakota and Wyoming, states with struggling economies in 2016, but fewer inbound moves than Nebraska, Iowa and Minnesota. While 41 states experienced an increase in gross domestic product (GDP) in the second quarter of 2016, South Dakota’s economy lagged, according to a recent release from the U.S. Bureau of Economic Analysis. South Dakota’s GDP declined by 1.0 percent in the second quarter, placing the state at No. 46 in the nation for economic growth. Regionally, South Dakota outperformed North Dakota and Wyoming, which experienced declines of 5.6 and 5.3 percent, respectively. Nebraska led the region in growth at 4.3 percent, while Minnesota experienced no growth and Iowa increased modestly at 1.3 percent. South Dakota agriculture played a key role in the state’s economic slowdown, dropping by 2.2 percent while mining fell by 0.4 percent. Real estate, durable goods and health care industries each edged up by 0.4 percent. South Dakota’s transportation industry increased marginally at 0.1 percent in the second quarter, but it was well below the national growth rate of 14.0 percent for this sector.